Rayguns and Rocketships has made it’s way to Kickstarter backers and onto retail store shelves, which is very exciting! We love how this game came to life and are looking forward to all the adventures that are just waiting to happen. In this Tabletop Spotlight, Designer Scott Rogers talks about Rayguns and Rocketships, how the game is played and some fun behind the scenes. 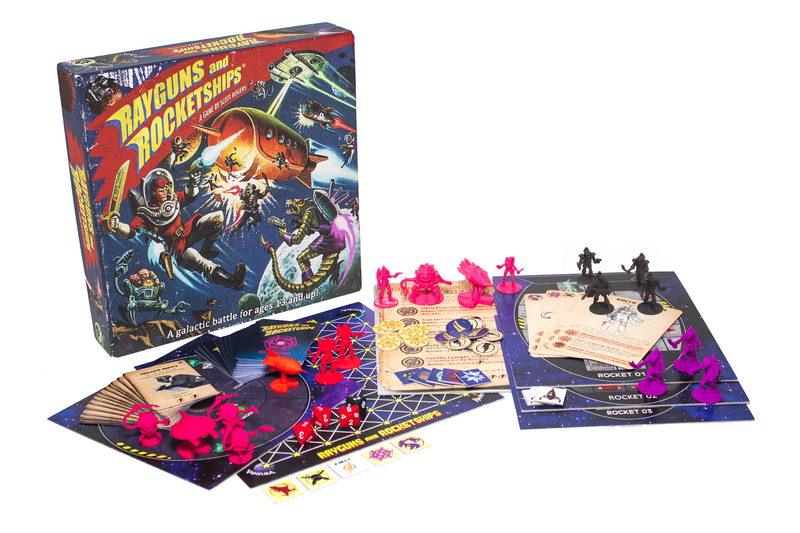 Rayguns and Rocketships is miniatures board game where players battle for control of the galaxy. The game was inspired by classic pulp science fiction. If you have seen Flash Gordon Conquerors the Universe, read comics drawn by Wally Wood or read the work of A.E. Van Vogt; then the galaxy of Rayguns and Rocketships will feel quite familiar. Rayguns and Rocketships gameplay is deep and yet simple to learn. 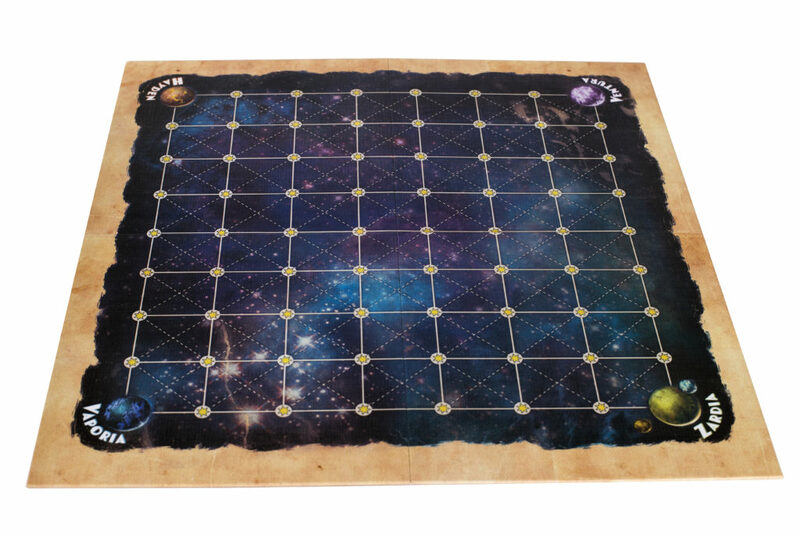 Each player controls a Planeteer faction consisting of a six-member crew and a captain. The human Astro-Rangers, the lizard Zard, the Star-Pirates and the alien Blaarg. Each faction has its own rocketships with its own unique layout. In the middle of the table is a star map with a grid that connect star nodes to each other. The rocketships fly along the star nodes as the crew operates functions within the rocketship. Gameplay consists of three turns per round, three phases per turn. The three phases are Rocketship Movement, Rayguns Shooting and Crew Movement and Action. 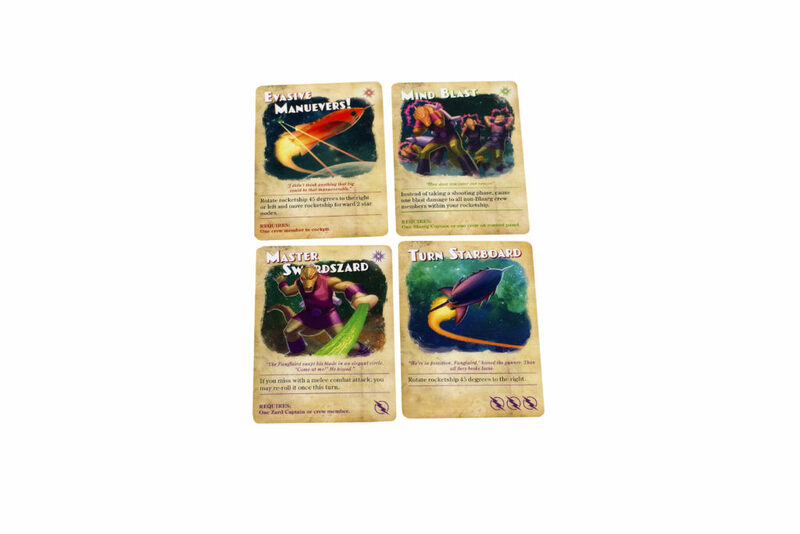 Rocketship movement is programmed in using Command Cards; three cards at a time, to be revealed – one at a time. When a card is revealed, the player must execute the command on the card. Additional rocketship movement and rotation may be made by placing crew members on an engine (for movement) or the cockpit (for rotation). 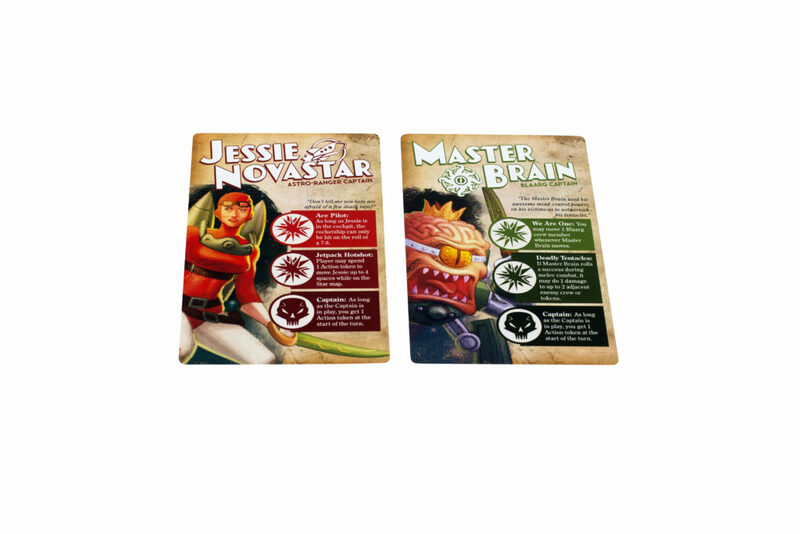 There are special Star Command Cards which grant faction-specific abilities and moves. Once these Star Cards are used, they are discarded but they grant the player 1 victory point. When the player reveal their Command Card they collect action tokens. These tokens are spent during the crew movement/action phase to help execute actions such as open airlocks, extinguish fires and re-energize crew members to gain additional movement and attacks. Knowing when to spend these are critical to a player’s success. Rayguns are fired during the rayguns shooting phase. Roll a d8 to determine a hit. An unmanned raygun hits on a 7-8 with a range of 2 star nodes while a manned rayguns hits on a 5-8 with a range of 3 star nodes. Damage can be done to the rocketship or a raygun. Doing 8 damage to a rocketship destroys it. Rayguns can also be destroyed – earning 1 victory point for the attacker. Rayguns can be replaced by spending an action token and making a successful roll using the rocketship’s hatch location. 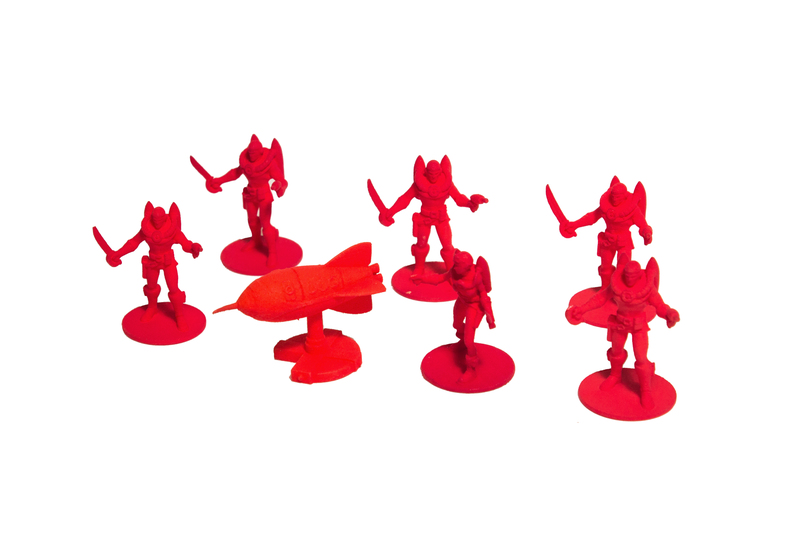 During the Crew Movement and Attack phase, crew can move about the rocketship – a move action is free and the miniature can move up to 2 spaces. They also get a free attack action. If the player wishes to move that piece again, it can be re-energized at the cost of 1 action token. Crew members can shoot with their neurolizer pistols or make a melee attack with their circuit sword. Defeating a crew member earns 1 victory point. Defeating a captain earns 3 victory points. However, a ranged attack may be dodged when the defender spends an action token and there is a risk of a melee attack being riposted by the defender – which gives them a free counter-attack! 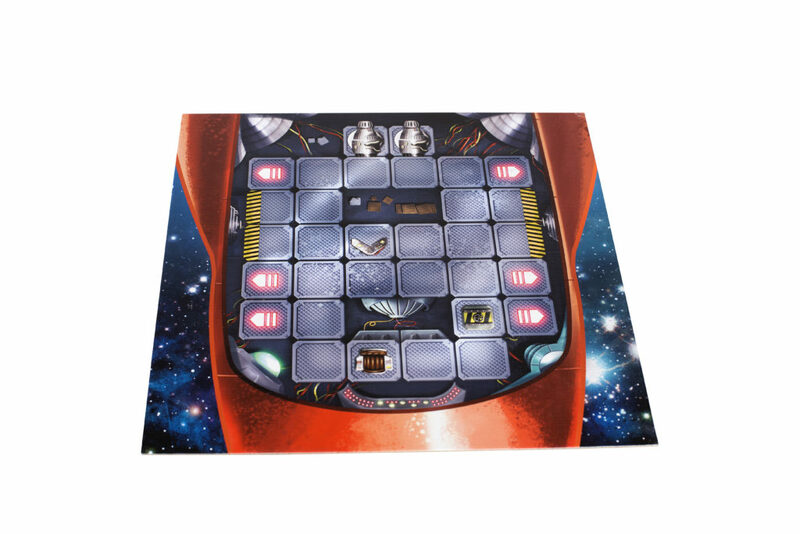 Combat can also take place on the star map by exiting an airlock or even on-board an enemy’s rocketship – provided the player succeeds with their attack to enter! The player who first earns a pre-determined number of victory points, wins the game. Rayguns and Rocketships also comes with several tokens and a ten-episode campaign book for even more gameplay variations. There’s an entire galaxy of fun and adventure to be found in Rayguns and Rocketships!